I presume this will be a wooden Klee? Another fun build from wmonk! 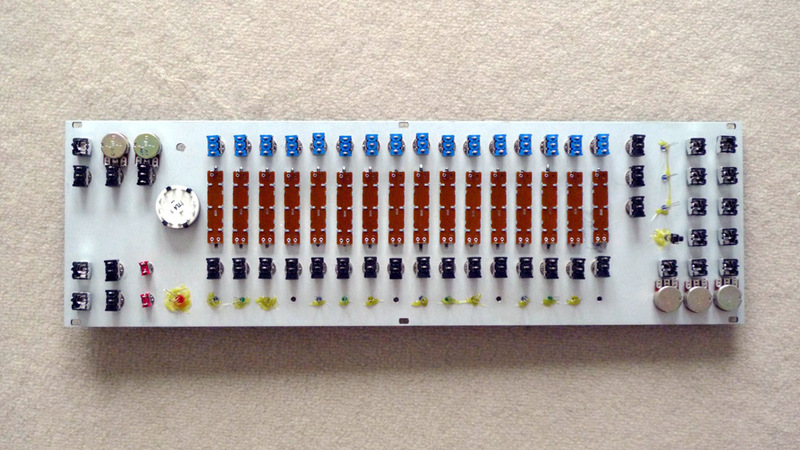 This panel creates a separate section for the voltage programmers, the pattern programmer, and the gate bus switches. I extended the concept and managed a design that fits nicely into a quadruple sized Aries panel (12" wide, 9" high). When I get home this evening, I will post a pic. I'm currently in the throes of wiring it up. I have all the strap wiring in place and am building the cables now. I hope to have it up and running within the week. 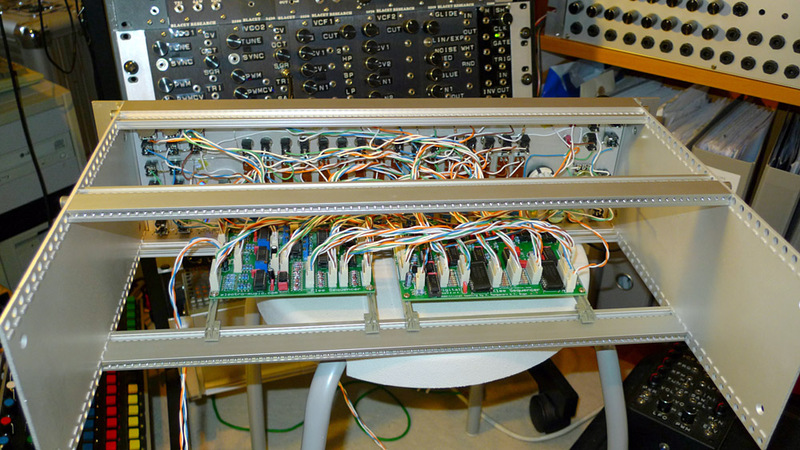 since I finished a pair of MFOS Voltage Quantizers, I've had a great time with my existing Aries Sequencer which is a very basic 8x2 design with no bells or whistles. 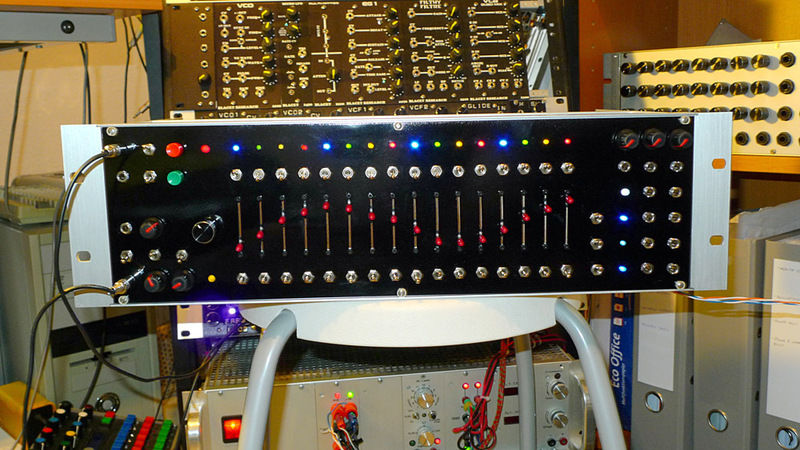 By far the most time-consuming part of the Klee Sequencer build has been to design a front panel. Thus, the thought of building a second one isn't so daunting to me now that I have a design. And -- after I had it all drilled and labeled, I discovered that I left the clock LED off of the panel (I also mislabeled the 8x2/16x1 selector). Well, I managed to drill another hole for the clock LED -- ugh, what a stupid thing to forget! Probably the result of working too late with the onset of fatigue. The mislabel was a cut and paste that I must have forgotten to change. It is a cosmetic issue that I'll fix later. I forgot the random reference LED from my panel. Amazing how long one looks at the panel when one is designing it too... and still miss it completely. Anyway, I look forward to hearing what you do with it. Figured this is a good place to show off my panel rather than the troubleshooting thread I had it tucked away in. psioniclabs, the job that you did is just amazing, sincerely congratulations. 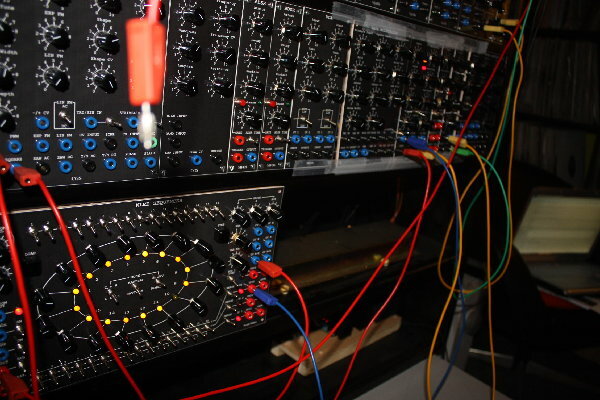 Actually Im thinking in a future mod my klee with new features, and I was thinking in also make a PCB for hold the front panel components, do you have reference numbers of potentiometers and switches? Ops! they are pots with led? My design is not so daring. This panel has a mislabeling error -- the switch marked "External, Internal Pattern" should be "Mode: 8x2 16x1. I had to sneak the Clock LED next to the Clock input jack on the right side -- it didn't show up very much in the picture. The switches sit a little bit higher than the pots, so it's good to add a thin washer to keep everything flush to the panel. 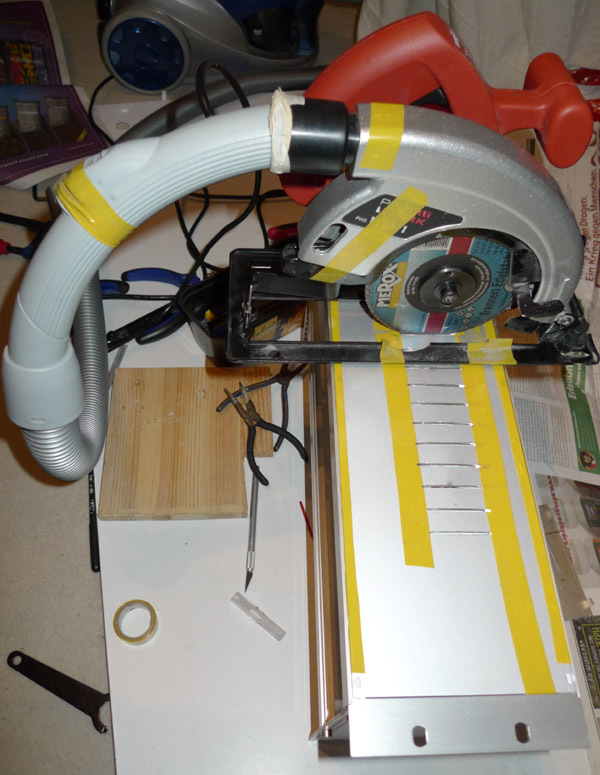 I detailed the whole process in a series of blog posts for my hackerspace group. 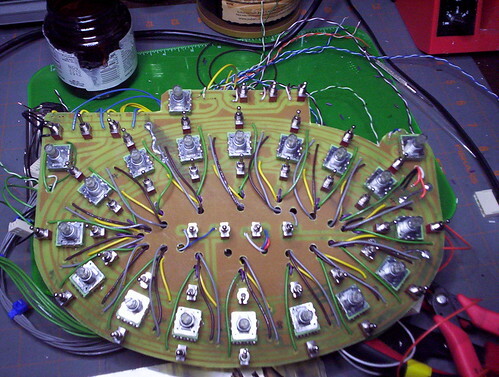 The PCB and panel layout was all done together in multiple layers using Inkscape. I laid out the footprints for the switches and pots and moved them around as objects until I had something that would fit in a standard printable page. Then I drew the component traces to connect everything. I overlaid independent layers and put graphics/drill guides on those. 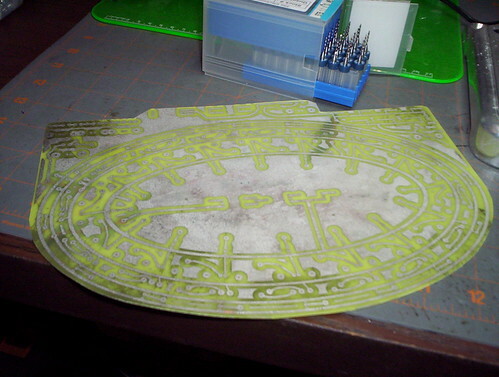 I made the PCBs from two graphic layers. 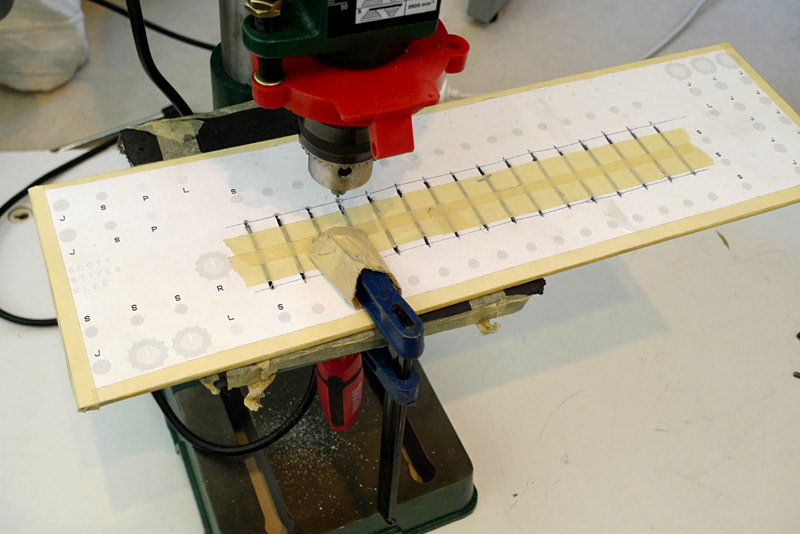 Then I printed out the drill pattern on a single sheet mailing label. Just peel the sticky side and apply to the panel! Tap the centers and drill it out. Finally, the graphics were done with the top layer printed on another mailing label. Liberal coats of clear coat enamel were sprayed on top of that. You can see that the actual cut steel panel is just slightly larger than a single 8.5x11 sheet of paper, so the edges are unfinished. Close enough though! I've found this method to be incredibly cheap and easy to do with very good results! Thanks very much for your reply psionicslabs. Do you have the link to that blog? kkisinger you designg is pretty elegant. What is the material? steel painted? how do you print the labels? The panels are 1/16" aluminum painted satin black. I used Front Designer software to design the panels and used DecalProFX to create the actual decals. 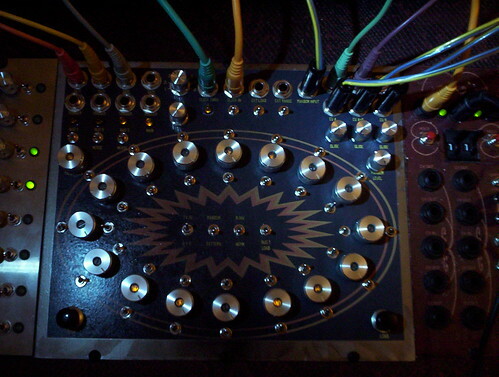 i still have a 2nd set of klee2 PCBs in the drawer and i toy with the idea of building myself a eurorack module from it despite my backlog)! currently i shrunk it to 60HP using pushbuttons with built in LEDs (as seen on my LPG with gate controlled mode). i would replace the manual range selection switch by a voltage controlled switch. what do you think? ideas? 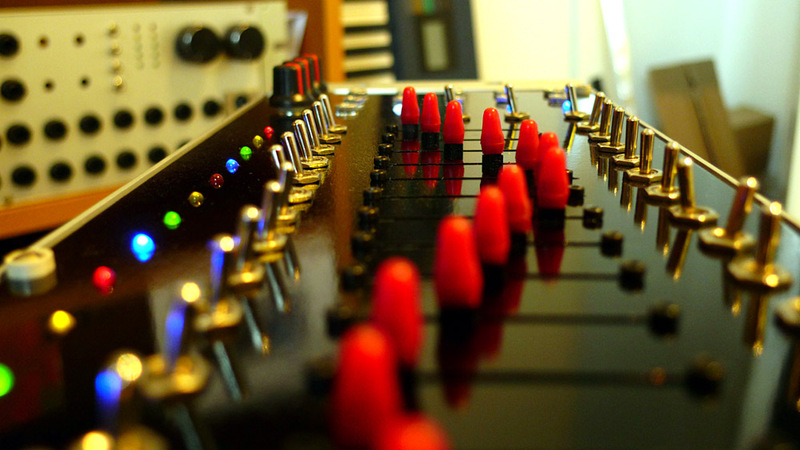 Perhaps if you went with narrow knobs (such as are used on mixing consoles) so that you gain a little more clearance for turning the knobs. In general, I have (thus far) designed for a little more horizontal clearance than vertical clearance because when I grab the knobs, my fingers are on the left and right side of the knob. 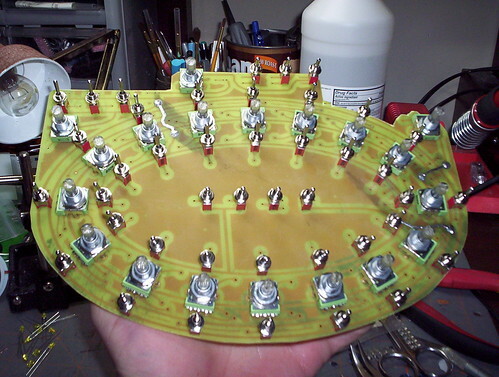 To combine the switches with LEDs is a great idea -- and certainly a space-saver! Matthias - beautiful panel design. I would concur with kkissinger's idea about smaller knobs for a little more space between. One other thing you might include (if it's important for you) is a switch for synchronous/asynchronous loading (although I'm not sure how it would fit into your design). I'm coming up with a simple mod for the Klee2 PCBs to provide that functionality if you're interested. i think state machine offers a nice little project for synced loading. 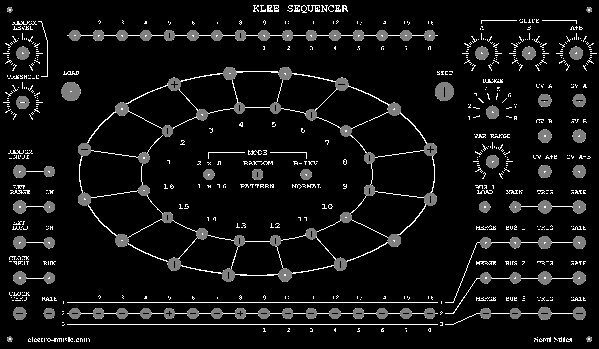 however, i am used to control my sequencers with dividers to keep/get them in sync. so no need for me. On the topic of knob sizes, here are two sequencer knob strips I'm working on. Both design for 19 inch rack mount panels. Bottom one is part of a P3, designed to use the 16mm ReAn soft touch knobs a lot of us use. OK to twiddle, but a bit restricted. Top one is a section of a 'Milton', (I'm currently shaking a few bugs out of he rather idiosyncratic design to make the LEDs work better). Pots are slightly wider spaced, and I got some ReAn P400s from Mouser. Much easier to use. I'm not sure if Mouser stock these in spline fit - they ones I got were for 'D' shaft knobs. The 'Milton' parts I got came with some Panasonic PCB mount pots. A big thank you to Tom Arnold for the kit, and to Cynthia Webster for advice on how to upgrade the LED and output drivers. There is a little mentioned factor to think about here though: the 'gearing' effect of knob diameter vs fingers. Small knobs are harder to get fine settings with. 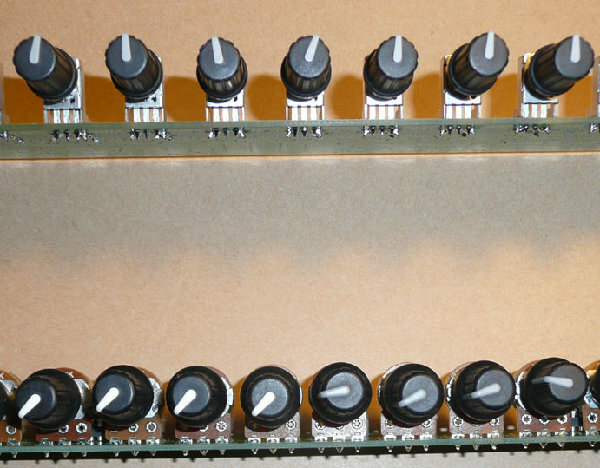 Having started out in life with old valve, (tube), based test equipment, where a small knob was typically 20mm/0.75" diameter, and the main controls likely to be over 35mm / 1.5", I can certainly see the advantage in a big, wide spaced panel. 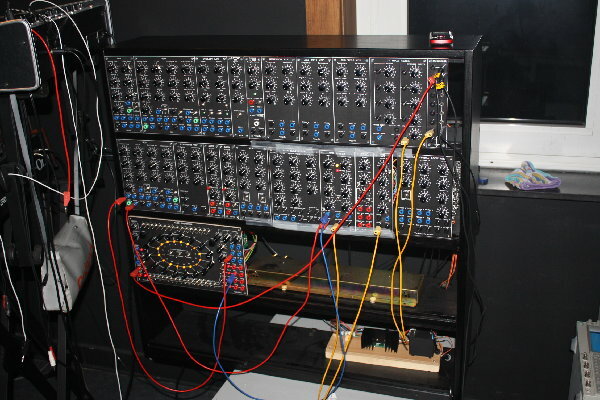 Not many of us have the sort of space Raymond Scott had though, or would want to do all that walking up and down the synth. 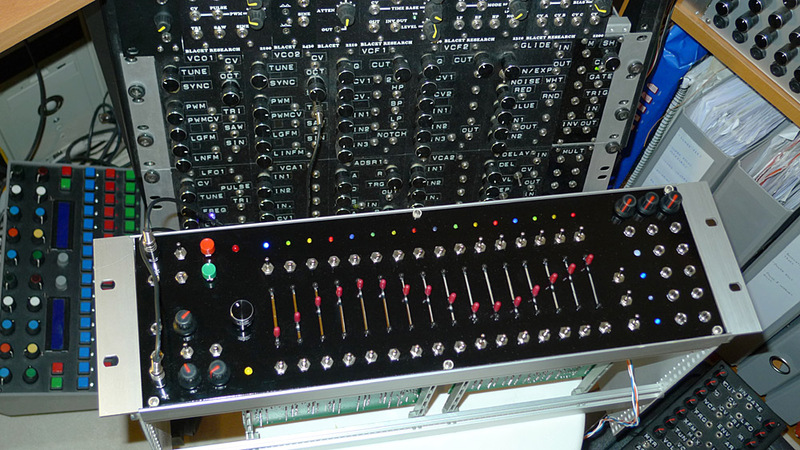 Good quality mixer style knobs are certainly a good idea in multiple arrays. 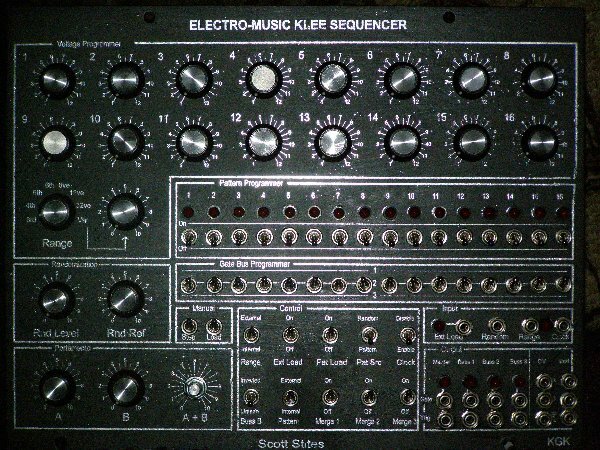 This panel is similar to my 1st Klee Sequencer. My first panel had a couple of mislablings that I've fixed here. The only thing I'd do differently would be to label the voltage programmers from 0 to 12 instead of 1 to 13. I just thought it would be fun to label them this way so the knob positions correspond to the notes when in the 8ve range. 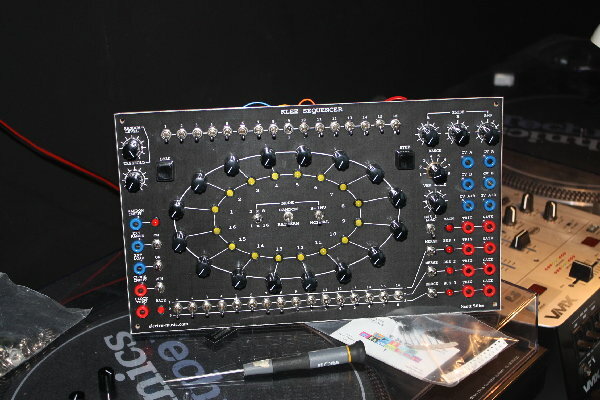 Finished my klee sequencer on the 28 of december 2010 and it worked directly though some switches where reversed (wire's) but that was an easy fix . The module is 4U (serge) like the rest of my modules. I based my design on Thomas white's design but made a more compact version. now that is cool! very cool! Posted: Thu Jun 23, 2011 2:59 am Post subject: Slide pots: Which lever length? 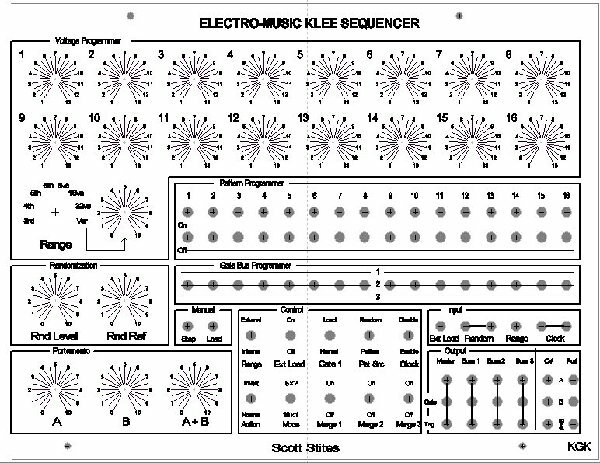 I'm about to order Bourns LED slide pots for my Klee and was wondering which lever length is recommended if I mount them à la Krunkus. There are 3 versions available: 10, 15 and 19mm. Yup, will give you the best resolution. I just stopped in to see the latest panels and stuff and man, I am impressed with all this great work !! !